Elwood, Ann. Ostriches, Emus, Rheas, Kiwis, and Cassowaries. Mankato, MN: Creative Education, 1991. Harris, Timothy. Ostriches, Rheas, Cassowaries, Emus, and Kiwis. New York: Beech Publishing House, 1997. Sinclair, Ian, et al. Birds of Southern Africa. Princeton, NJ: Princeton University Press, 2002. Manilus, N. "The Ostrich in Egypt: Past and Present." Journal of Bio-geography (August 2001): 945-953. Ostrowski, S., et al. "Evidence of a Dramatic Decline of the Red-Necked Ostrich Struthio camelus camelus in the Air and Tenere National Nature Preserve, Niger." Oryx (October 1, 2001): 349-352. Potts, D. T. "Ostrich Distribution and Exploitation in the Arabian Peninsula." Antiquity (March 2001): 182. 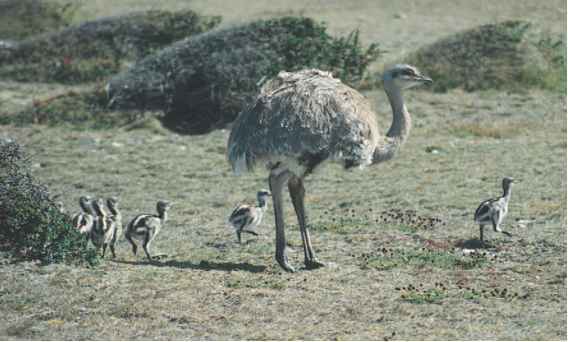 Thompson, Rebecca S. "Raising Emus and Ostriches." United States Department of Agriculture Special Reference Brief, No. SRB 97-06. (November 2000). American Ostrich Association. http://www.ostriches.org (accessed on June 25, 2004). Donegan, Keenan. "Struthio camelus." Animal Diversity Web. http:// animaldiversity.ummz.umich.edu/site/accounts/information/Struthio_ camelus.html (accessed on June 25, 2004).